Which brings me to today’s favor – personalized tea bags! These would be an ideal gift for a couple who loves tea or if you’re hosting a lot of out-of-town guests on your big day. You could include these personalized tea bags in a welcome bag for out-of-town guests along with a mug (more fun than a tea cup) and some local cookies or other sweets. Or you could include them as part of your favor – maybe paired with a locally-made honey for a fun combination. 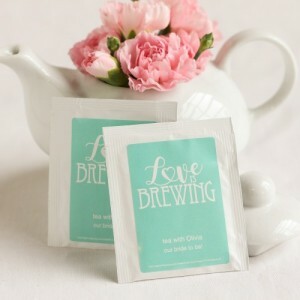 You’ll find these personalized tea bags here.